The FAU gastronomy section struggles for a strong movement in this branch. Waiters of a trendy leftist club in Dresden are on strike. All of them are members of an anarcho-syndicalist group and have been fired for dubious reasons. Now the local branch union fights for re-employment including a company agreement or alternatively the collectivisation of the business. The colleagues founded a workplace group in May 2013, in which all waiters of the club have been organized. In May/June they forced a 20% wage increase. After that, they organised themselves with colleagues from other companies and founded the BNG-FAU (Gastronomy and Nutrition Section of the FAU) in July, 2013. Last month, half of the employees were surprisingly fired. BNG-FAU interpreted this as attack on the waiters' unionist organisation and threatened to start a strike. 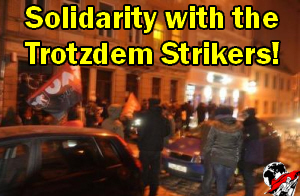 When the owner of the restaurant "Trotzdem" refused to negotiate, all organised workers started a strike on February, 2014. Although the temperature sunk to -2 °C, around 10 to 20 people make an informational action for the customers every day from 8pm to 12 am. On the third day, the club owner started to engage scabs, yet the business dropped due to the solidarity customers who avoided visiting the club. The press feedback ranges from local to nationwide reports about the conflict. Strikes of gastronomy workers, who earn 450€ a month at most, are uncommon in Germany. The centralised unions only have members in some of the few larger clubs and restaurants. So BNG-FAU already became more visible in Dresden's gastronomy scene than the social democrat NGG (Food, Beverages and Catering Union). The club's owner is trying to sit out the situation while the number of guests steadily declines. The BNG-FAU pickets talk to colleagues from other clubs to extent the conflict to other companies. On February 10, two lectures and an open discussion to inform about the situation in the gastronomy sector are planned. During the upcoming week, there will be a public labour law training course and a demonstration. The pickets of the BNG-FAU visit other clubs on a daily basis to inform people about the conflict and our union. The comrades would be glad to receive solidarity greetings from other countries to exemplify the solidarity of libertarian workers.